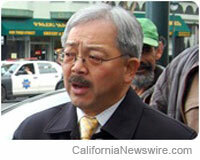 SAN FRANCISCO, Calif. /California Newswire/ — This past week, S.F. Mayor Ed Lee announced the launch of the StepAheadSF Microloan Pilot Program, a new program that will provide $250,000 in zero percent interest loans to support small businesses in neighborhood commercial corridors citywide. StepAheadSF, administered by Working Solutions, will provide loans to individual small businesses. The program will begin in Chinatown, which was just named one of the Top 10 Great Neighborhoods for 2013 by the American Planning Association. StepAheadSF will provide qualifying businesses with financing for a variety of investments such as developing a new business product, purchasing inventory, capital improvements to comply with the Americans with Disability Act and façade and tenant upgrades, and for marketing and promotional activities. Working Solutions will work with applicants to reduce turnaround times to 1-2 weeks and will focus on qualitative information – getting to know the borrower, learning about the business, and understanding the local market – to better assess risk and successfully make loans to a wider group of small businesses. The zero interest loan program is being launched to further support businesses and preserve neighborhoods like Chinatown; which was named today by the American Planning Association (APA) as one of the top 10 Great Neighborhoods for 2013. The APA recognized Chinatown for its historic role as a cultural capital, storied architecture, history of community activism, and planning and community economic development efforts that have preserved the neighborhood’s character and identity. The program builds on the City’s loan products developed through Mayor Lee’s Invest in Neighborhoods Initiative which provides focused, customized services to 25 neighborhood commercial districts throughout San Francisco. The StepAheadSF – Microloan Pilot Program builds upon a portfolio of accessible financial and loan assistance programs including the Kiva Zip, a crowd-sourced microloan program for entrepreneurs that provides funds of up to $5,000, the Revolving Loan Fund for funds up to $50,000, and the Emerging Business Loan Fund for funds up to $1 million, to Invest in Neighborhood storefront businesses citywide with focus on businesses that have difficulty accessing capital from traditional sources and institutions. “I am thrilled that Chinatown has received this prestigious level of recognition. We will keep working with the Office of Economic and Workforce Development to continue empowering neighborhood stakeholders to plan and advocate for the small business, transportation and housing improvements that will maintain Chinatown’s vitality,” said Cindy Wu, Community Planning Manager, Chinatown Community Development Center and the Vice President of the Planning Department Commission. San Francisco’s Chinatown is the most populated neighborhood west of New York City and the oldest Chinese community in the U.S. Residents strategically and quickly rebuilt after the 1906 earthquake and fire to draw tourists and thwart a proposal to move the leveled neighborhood elsewhere. Contributing to Chinatown’s sustainability is its housing, and low percentage of households owning a car. A core strength of this iconic San Francisco neighborhood is the rich array of storefront businesses that serve Chinatown residents, and tourists, and families from the greater Bay Area. “We are grateful to APA for recognizing one of our great neighborhoods, and the value of good planning to make great places. We recognize economic vitality is important to preserving the cultural heritage and long term economic sustainability of Chinatown; while improving the neighborhood’s physical character to best serve its 15,000 residents and the millions of tourists that visit annually,” said John Rahaim, Planning Director for the City and County of San Francisco. Invest in Neighborhoods staff are currently developing a customized service plan that will strategically deploy additional city services and programs to ensure that Invest in Neighborhoods corridors such as Chinatown have the resources necessary to create, maintain, and grow healthy neighborhood commercial districts. To learn more about Invest in Neighborhoods programs and resources in support of small businesses through the Office of Economic and Workforce Development, go to www.oewd.org. For more information about the APA’s top 10 Great Streets and top 10 Great Public Spaces for 2013, visit www.planning.org/greatplaces. For more about National Community Planning Month taking place throughout October, visit www.planning.org/ncpm/.